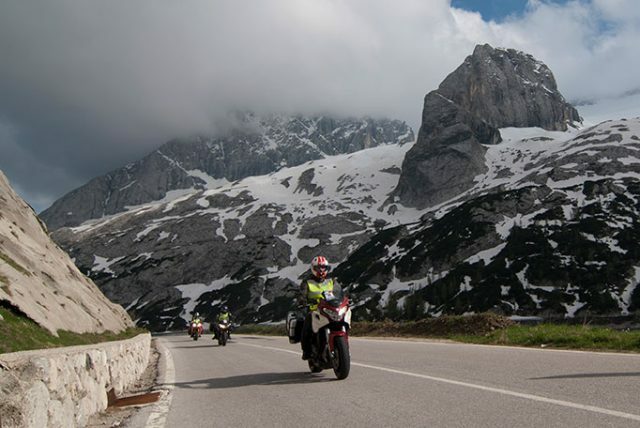 Third edition of tips for motorcycling travellers, found on the net, carefully selected by our GIVI EXPLORER team based on the originality, interest and usefulness, and the different levels of experience motorbike enthusiasts have. Take notes. It’s often talked about how important it is to sit correctly in the office since so many hours are spent there in front of the computer ….. and what about those who spend hours and hours on their bike?The position considered comfortable for a ride of an hour or two can become unbearable when the road gets longer. Back pain is around every corner! Motorcycling companies decide on the height of the seat, the distance of the handles Etc. in base of the standard parameters (let’s say on an average body). If you are outside this standard body type it’s very possible you should evaluate the possibility of making adjustments to the producer’s idea of the correct positioning. Often it’s enough to make a small adjustment, and your level of comfort on the road will alter considerably. Are you happy because you woke up with the sun shining down on you? Does the weather seem perfect? Never let your guard down. You might also find yourself in the middle of a blizzard in another 50km, with rain and freezing temperatures. There are countries where the weather conditions change repeatedly. Don’t be caught unaware. Your waterproof clothing must be in easy reach. Searching though your luggage to find it while you’re increasingly becoming wetter and wetter …….. is not an ideal situation. When possible, look for a hotel that has its own restaurant/bar or one nearby. The point is to avoid getting back on the road after sunset in unknown areas and especially if that day’s journey has been long and tiring. 4) IN A HURRY TO LEAVE THE NEXT MORNING? Is the destination at the end of the day a city with a good deal on a hotel or motel for the night? Have you planned on setting off early the next morning? Consider looking for a room on the outskirts of the city, which would be more convenient when setting off: it allows you to avoid the rush hour city traffic. 5) ALWAYS IN A HURRY TO SET OFF? If you don’t have the police on your heels, enjoy your trip. If along the road you see something interesting, pull over. It might prove to be a memorable pit stop. If you find yourself on the other side of the world, you very likely won’t have another chance to come back. It’s better to set yourself back a few hours than to have any regrets! If you’re travelling alone, to avoid unfolding and folding the paper map, fumbling around for your glasses etc… you could take a snap of the portion of the map that you need with your smartphone (through the app called CamScanner you could save it as a pdf, even if in our opinion a photo works just as well). This way, it’s enough to pull over, zoom in to the point that you’re interested in. It’s very convenient and the light of the screen means there’s no need to search for a torch when there isn’t much light. A short metal cable, with rings on each end (can easily be found in the anti-theft section for bikes) and a numeric lock (but the helmet one that comes with the bike also works well), can give an extra protection to a bag, a jacket.. during a brief stop. A small towel, or even better, a synthetic shammy cloth to keep on hand in the morning, to wipe the dew off your seat, and clean the windscreen and mirrors before leaving. A light, foldable cover for your bike to cover your bike at night. It keeps it dry and often can deter possible thieves. A hydration kit to stick in your backpack so that you can drink while on the road. These are used in the off-road world, but they’re also useful if you’re riding in summer in particularly hot areas. Bags that will keep your clothing dry. Even though the hard side cases get removed from your bike each evening, the clothing inside can still take on humidity. For sale you can find soft ad hoc bags to insert inside your side and top case. If you went on your trip without them, a regular, large bin bag can be used instead. Eye drops are often left at home. But it’s easy to pick some up in any chemist. Use them on days when you cover lots of ground, on your petrol breaks. They’ll make you feel better. Always search on the net to see if it’s worth booking a hotel or B&B online, even a couple of blocks from you. Bookings done on line, rather than turning up directly at reception, can be of better value in number of situations. At times even, a quick search on line might turn up an available room for that hotel you’ve just ridden past with the ‘no vacancy’ sign. It’s all to do with different conventions. If you can access the net, try it out. 9) MOTORBIKE VACATION OR A TEST OF STAMINA? On a long tour, plan a day of relaxation each week, perhaps even to do nothing. Time to laze about might be a luxury, but in many cases it might be needed to remind yourself you’re on holiday, and it’s not a race to the end. If your trip takes you far from home, don’t leave without a spare key … that you will obviously keep separate from the main one. A good idea is to hide it in some part of the motorbike. Perhaps by using a metallic strap or a strong tape or undoing the light or tail-light and inserting it there. Your choice. Many motorcyclists also hide small amounts of money. The seat covering is also a good hidey-hole. It’s nice to dream, but it’s better done in bed. When you’re travelling by bike in an unknown area, try to be realistic, especially with the number of daily kilometres you plan on clocking up. For example, in scenic areas that aren’t flat 200/250km can easily fill up your day. Don’t take for granted good road conditions. Make sure you take enough stops.